SkyWave will be showcasing our satellite/cellular devices and applications for industrial asset monitoring and control at GITEX Technology Week 2014—one of the world’s largest and most influential Information/Communication Technology events. The latest smart devices enabling workforce automation and increased efficiency in the oil & gas and other industries by connecting in-field workers to the back office, regardless of network coverage. Innovative solutions designed to get solution providers to market quickly with SCADA and fleet management applications. The advantages of Inmarsat‘s IsatData Pro global satellite network, with life beyond 2023. You can also schedule a meeting with SkyWave to discuss your unique remote monitoring needs. 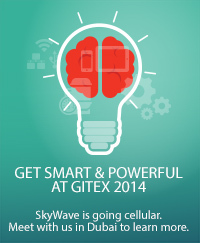 Stay tuned to the blog and @SkyWaveMobile on Twitter for live updates and takeaways from the show floor. ‹ Water & Fracking: Will Real-Time Monitoring Help?